When you look at the toughest adventure event in the world, the Dakar Rally, the bikes are all 450s now. They’re a far cry from the tribe of road-focused 1200cc road bikes that has evolved from the earlier generations of desert racers. So perhaps for everyday riders, a smaller capacity may offer the best balance of on-and-off road ability. 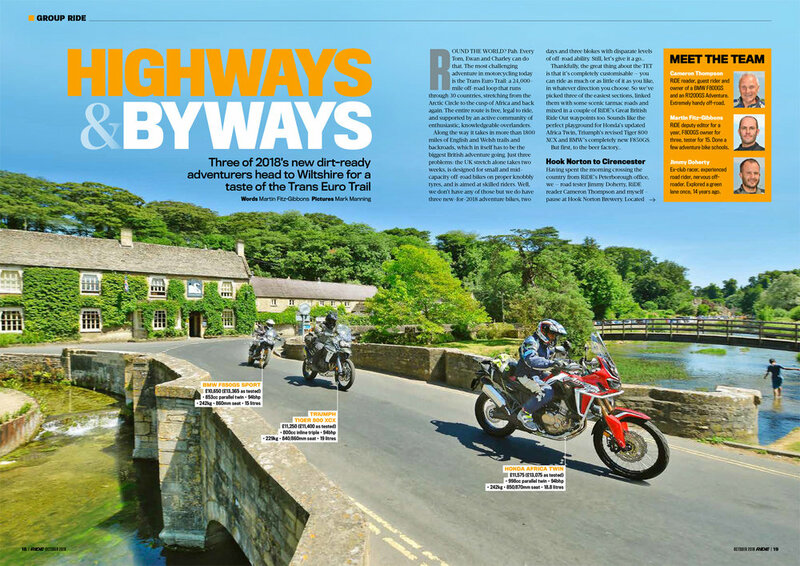 This month the road testers crossed hundreds of miles of tarmac to ride the British stretch of the Trans Euro Trail on the updated Honda Africa Twin and Triumph Tiger 800 XCX plus the all-new BMW F850GS (which still has a bigger capacity than the original Dakar-winning BMW R80G/S). Meanwhile Chris Scott tests the BMW G310GS in the desert. Whatever you ride, and wherever you ride it, enjoy the summer — and enjoy this issue.